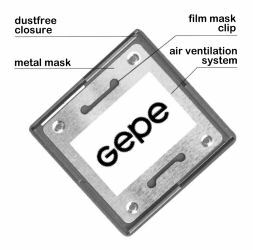 GEPE slide mounts are one of the best precision mounts that we have found for 3-D slide projection. Each mount consists of two snap-together halves. Each half consists of a plastic frame, a sheet of ultra-thin glass, and a precision metal film mask. One half is white, and faces the projection lamps to prevent heat buildup. The other half is grey, to reduce internal reflections and assure a clean image. GEPE mounts fit all types of straight, circular and cube slide trays EXCEPT the Kodak Carousel 140 trays. No glass mounts from any source fit this size tray. No. 6001 (24 x 36mm): The standard size for 35mm full-frame slides. No. 6101 (18 x 24mm): Half-frame format. For users of twin half-frame, Nimslo/Nishika/ImageTech cameras, or any beamsplitter systems (pairs to be cut apart) which produce two half-frame size images side-by-side in a normal 35mm frame. No. 6301 (24 x 24mm): For Stereo Realist Format combine one side of 6301 with one side of a vertically oriented 6801 (21 x 28mm) to easily create a 21 x 24mm opening - the closest match to standard Realist-format. This way Realist-format stereo camera users may separately mount slides for twin projector showings. 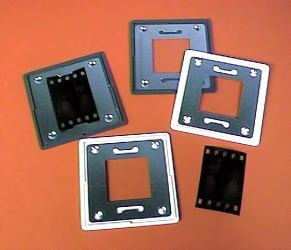 This mount is also perfect for any situation where a square format is desirable, or for duplicates of Realist format slides which are enlarged slightly. No. 6801 (21 x 28mm): By using one half of a 6801 mount vertically oriented with one half of a 6301 mount, a Stereo Realist size opening (21 x 24mm) is easily created, as described above. A good choice where both vertical and horizontal cropping is necessary. Can also provide image height cropping of European fromat stereo slides. No. 6803 (24 x 28mm): This mount has the same size opening as "European" stereo mounts, and is perfect for separate 2" x 2" mounting of image pairs taken with the Verascope F40, Belplasca, Iloca I or FED stereo cameras. Easy to use, professional quality.